What follows is a Washington Post video brief of Trump's rally in Montana. The full rally is reported by rational media to have been nothing shy of zany and erratic. Washington Post published this Jonathan Capeheart opinion piece regarding the Oozfest. If you think back t the last time you heard a US President deliver such reality TV comedy and personal self-direct unctuousness consider sharing the name of the president. I suggest you will spend many hours reading or viewing video; I also believe you will come up empty-handed while considering the time spent as craziness on your part. You knew better when you read the challenge. Trump/ss performance rallies simply validate the reality of a person who won the US presidency via the psyches of celebrity worshipping sycophants and the nation's voter apathy. Apathy in 2016 supported by Putin's cyber tricksters and GOP/TN success at suppressing votes. So Trump's ushers his team around the nation thrilling audiences with utter nonsense and narcissistic diarrhea. He performs as such while his Korean carnival act unravels due to a lack of real substance and secret talks. His tickles audiences while alienating historic US economic and military allies with parallel suckling-up (spelling intentional) to international dictators and strongmen. Alas, he entertained in Montana while his Homeland Security ICE depfamilying force is failing to reunite immigrant children with their parents. Some parents have been deported. And he entertained the Montana worshippers via disparaging two US war heroes, racial profiling Elizabeth Warren and poking fun at a movement (#Metoo) which has proven effective in revealing man physical abuse of women. While his tariff retaliation starts to reach into our wallets and serves, he entertains. Entertainment isn't worth the letters of the word without visibility and coverage. The carnival barker is relegated to a meandering fool when the cameras are not present. 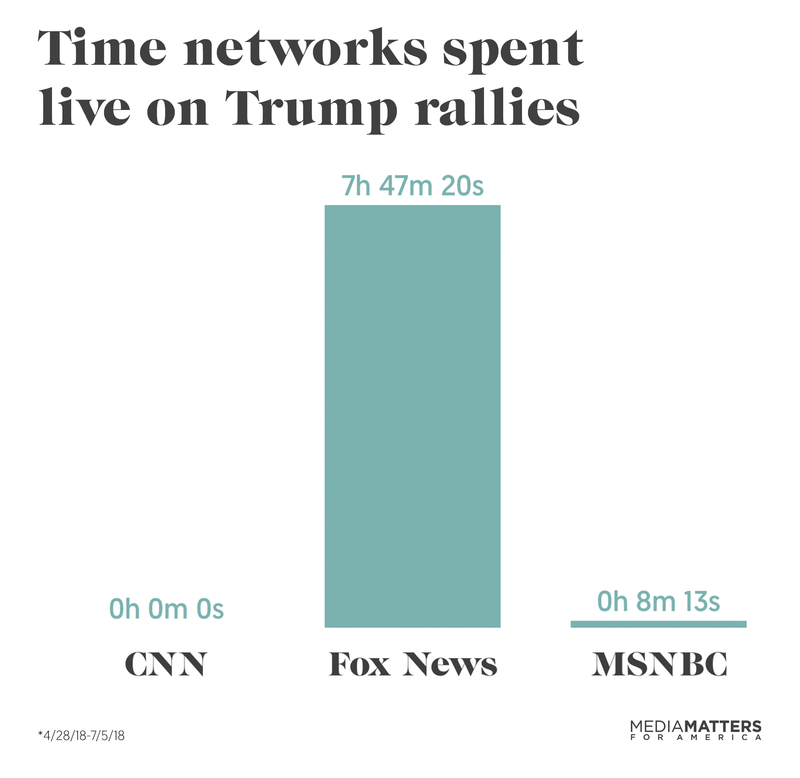 Two cable news networks have taken steps to relieve its viewers of Trump's rally performances. Apparently, CNN and MSNBC network executives and producer sentiment fall in the realm of: 'Why bother and We are better than the coverage." In more simple terms, if we ignore the spoiled kid, he may modify his antics. 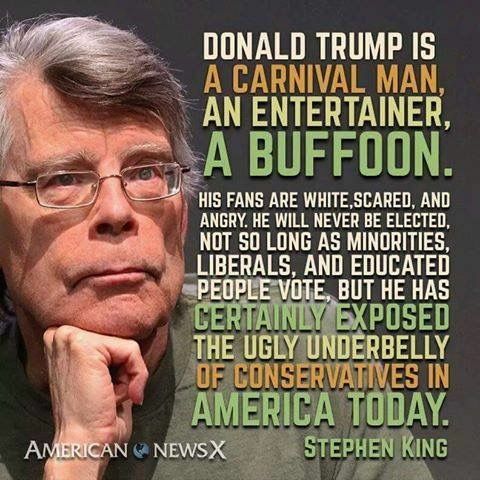 Of course, there is one major cable network which not only will continue to offer Trump's carnival acts, the network reaps the reward of serving as Trump's state TV; a status which guarantees rating revenues and happy viewers. The excerpt image (below) regarding hours and minutes coverage comparison is accompanied by another telling graphic. The article also shows the extent to which Trump receives millions in free advertising via Fx News. Of course,e you know Trump recently hired a fired Fox News executive: Shine. A cast-off from years of sexual abuse charges and out of court settlements at the network. Kudos to CNN. Why does MSNBC even bother?